Mark Jacobson brought to you by Shell. Finns have traditionally had a low self-esteem and have been very concerned what others think of them. Running into Mark Jacobsons 100% RES energy scenarios gave me a rare chance to come in touch with my inner Finn. For this I wish to thank him. His “visions” are visibly marketed online for example at 100.org website and National Geographic with a help from none other than Shell. (For the actual papers and associated pile of excel files see here.) Reading his papers and excel files made me wonder, what have we done to deserve his wrath? Let me elaborate. As a backbone of our energy system Mark Jacobson and his accomplices grant Finland 29 GW capacity of onshore windpower, 27 GW offshore, and almost 50 GW of photovoltaics. For reference notice that our maximum electricity demand is around 14GW in the winter and 9 GW in the summer. Total energy consumption is somewhat less than 400 TWh. In size we are about 1% of EU which has around 90GW of photovoltaics installed. So according to Mark on a windy sunny day production could be more than 10 times our demand and around 7 times the maximum (winter) demand. Our installed PV capacity would be comparable to whole PV capacity in EU today which has, after all, spent around 10 years constructing it. This all seems a bit intimidating. Considering how off-scale this is it is noticeable that Jacobson spends very little time spelling out the details of how exactly are we supposed to cope with implied massive swings in production. From his excel file I cannot find details on what he assumed for our grid and how much his assumptions end up costing. He also says there won’t be any new hydropower (we have 3.2 GW), but there might be pumped hydro storage. They tell us “…we restrict our calculations to assume each country can generate all of its annually-averaged power independently of other countries, since ultimately this goal may reduce international conflict.” So that water will be sloshing somewhere in Finland since otherwise we might invade Sweden and Norway (and Russia while we are at it). Makes sense. If I read this correctly our hydropower is supposed to be configured in such a way that it pumps water upstream at massively higher powers than downstream. Somehow I feel we need a 2nd opinion from someone with actual competence in engineering. (Maybe Mark meant that we were supposed to use hydrogen storage somehow? Well, no he didn’t. According to him just 1.24 GW, out of total average demand close to 30 GW, or about half of the transport demand was diverted to electrolysis. Something very weird is happening behind the scenes and I have a nagging suspicion science fiction is involved.) Also note that our electricity demand is never less than about 6GW so potentially we are supposed to shut down the country for Mark. No problem! Furthermore, why doesn’t Jacobson tell us where those mythical pumped hydro storages are? If you have a look at the topographic map of Finland, you will quickly realize why this is a critical question. We are a mountainous country…by dutch standards. Finland is a flat country. If you drain our biggest lake Saimaa (the funny shaped water area between Lappeenranta and Joensuu) you might get around 5 TWh of energy. It feels unnecessary to point out that this cannot be done. Furthermore, you cannot even pump all that much water into the lakes since that would flood the cities, summer cottages, roads, and railways next to the lakes. Jacobson should probably add an army of goons into his employment figures to ensure the continuing happiness of our sad little country when his plan is being implemented. Jacobson also suggests we get about 20% of our energy needs from photovoltaics. This made me laugh. Here is a picture from the moment when my power consumption for 2015 peaked. Of course a Finn would check the scenario not just for Finland, but also our dear neighbour Sweden. Sweden is about twice our size and has per capita GDP that is roughly comparable to ours. To remind you, according to Jacobson we are supposed to get around 20% of our energy from photovoltaics. Sweden on the other hand is inflicted just with around 1% share. Mark lets us play on our strengths — sunshine! According to Jacobson upfront capital costs for the electricity generators alone would be more than $225 billion. This is about the same as our GDP. What about Sweden? In Jacobson’s scheme Sweden will pay less than $170 billion in upfront investment costs. Less than us even though they are twice our size. Thanks Mark. What is it? IKEA? Nobel committee? ABBA? In Jacobson’s vision employment in our energy sector grows from about 38000 to 130000. Doesn’t this mean massive productivity reduction in our energy sector? Isn’t that a bad thing? In the topsy-turvy world of 100% RES discussions this is of course not so. Jacobson instead talks as if we are winning by spending more. By inverting the logic of productivity increases that I suspect pretty much all economists (whether on the left or right) agree on, he talks of our $8.15 billion/year “earnings due to jobs” as if we are winning. Sweden would end up employing only about half what our energy sector would do (quarter on per capita basis) and they would get just 0.96 billion in earnings due to jobs. Take that Sweden! How does Jacobson actually end up with the claim that his vision would make any economic sense? He gets this basically by estimating body counts from PM 2.5 emissions and then multiplying this by “the statistical value of life”. 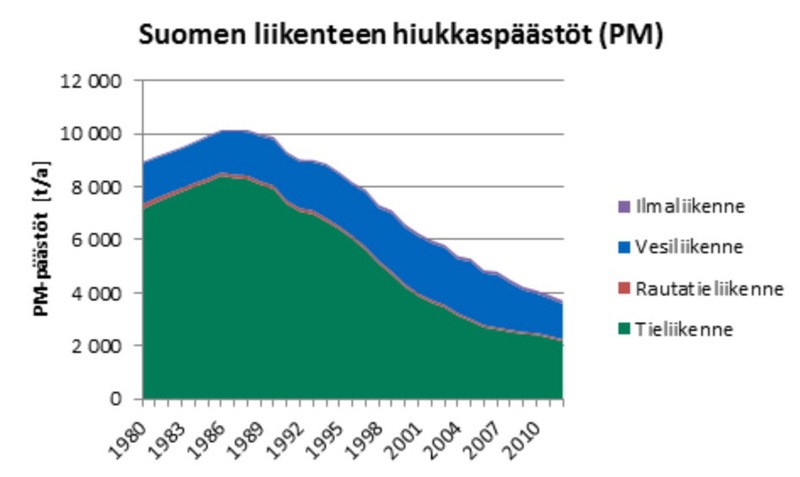 In this way he claims that in 2050 Finland emissions would kill 600-6000 people and cost us maybe more than $100 billion or about 30% of our GDP every year. Wow! This is crazy on steroids. First of all I think this is inappropriate use of the concept “statistical value of life” and 2nd it doesn’t pass the sanity check. Here PM emissions have declined drastically in past decades thanks to cleaner fuels, filters, centralized power plants replacing small scale burning etc. What am I supposed to learn from Jacobson’s figures? That in 80s when emissions were much higher, we lost basically all our GDP because of pollution? Also, is there someone who has a life insurance for 17 million. Isn’t maybe 100000-200000 more typical…1% of their claim? Jacobson and his friends assign pollution problems to the energy system as a whole and ignore that lot of it here is actually caused by small scale burning of bioenergy. They also deny the existence of alternative ways to address pollution concerns. History already tells they are incorrect in this assumption. In summary, thanks for dropping by Mark! Now don’t let the door hit you on the way out. P.S. Jacobson’s work is a treasure trove of nonsense and since I seem to like poking on carbage, I will probably return to it later. I name this post with “Part 1” for that reason. Että näin. Ilmeisesti riittää, että katsoo paljonko energiaa tarvitaan, sitten laskee kuinka paljon uusiutuvaa tarvitaan jotta se määrä wattitunteja saadaan kokoon, kirjoittaa numeron paperille, ja se on siinä; todiste, että pelkillä uusiutuvilla pärjätään. Höysteeksi voi vielä kirjoittaa muutaman lehtijutun, jotta somessa riittää taas juhlittavaa. I suggest you import a mountain or two from Switzerland. They seem to have lots of them. Couldn’t agree more. Would make everything simpler. It’s almost like we should be spending most of our green energy funding on research for energy tech that could actually replace existing systems.